The Skinny: Uncharacteristically low-key for a Jet Li film, this action-comedy still manages to entertain and even charm with its action and sense of humor. The action sequences aren't bad, either. Jet Li’s latest is a curious film. It’s an action comedy about Fu (Jet), an ex-soldier who gets hired by a low-rent triad (Eric Tsang) to chase a $100 million dollar hit: to kill the King of Assassins, who was responsible for the murder of a powerful Japanese crimelord. Thing is, everyone and their brother is after the reward, including the Japanese guy’s son, who’s damn intent on getting that 100 million for himself. 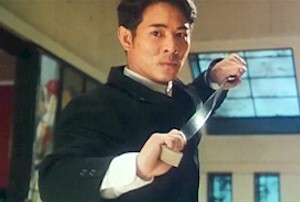 Fu seems to have the ability to get the job done, but he’s too damn nice, which is a perfect fit for Jet Li the actor. This is actually the best character Jet Li has played in a while, eschewing his humorless acting for a gentler personality. This film effectively dodges the previously inescapable Jet Li bullet: no personality. Eric Tsang and Jet Li make a good team, with Tsang edging Li in the acting department. However, Li isn’t too bad, and we hear his real voice for the first time. Notes:  In 2002, Hitman was hijacked to the United States by Columbia/Tri-Star, who went the Disney route and cut, dubbed and retitled the film Contract Killer.